Brandie Verzanie completed her 30 hours of inservice training to become a CASA volunteer. She was sworn in by Honorable Judge Burns on September 19. She is very enthusiastic and is looking forward to helping youth that are victims of abuse and neglect in our court system. Fillmore County CASA is looking forward to having Brandie be a part of the group of dedicated volunteers. Fillmore County CASA currently has nine volunteers. Fillmore County CASA staff and Board members are also proud to announce that Loren Eichelberger was nominated for the Step Forward awards of Serve Nebraska. Eichelberger, Volunteer Coordinator for Fillmore County Deb Mohlman and CASA of Nebraska State Director Corrie Kielty attended an awards luncheon outside of Ashland, on October 26. Eichelberger was one of the three finalists nominated and picked by the governor. 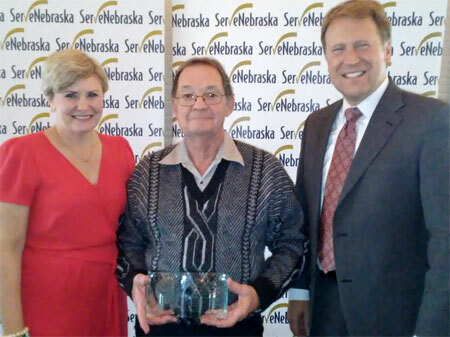 His name was announced as the winner of the Adult Volunteer of the Year award for Nebraska.